Vintage Boxed Flatware Set 2 Spoons 2 Forks 1 Knife 800 Silver. 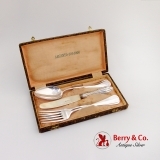 This elegant set measures: the spoons are 8 1/8" long, the forks are 8 1/8" long, the knife is 7 7/8" long. The excellent original condition and clear detail, with no monograms, make this an especially attractive offering. Early 19th century Portuguese 958 silver set of a wick trimming scissors with a tray, both decorated with the floral and foliate patterns. The scissors have figural snake handles. There is an engraved monogram "JH" on the tray; it also has a four ball feet. Oporto, Portugal. This incredible set measures: the scissors are 6 1/4" long; the tray is 10" long and 4 7/8" wide. Total weight is 318.1 grams or 10.2 Ozs. Troy. Spanish sterling silver high relief shell form bowl sitting on three figural griffon feet, c.1900. This beautiful bowl is 8" long, 7 3/4" wide and weighs 346 grams or 11.1 ozs Troy. The excellent original condition and clear, crisp detail, with no monograms, removals, repairs or alterations, make this an especially attractive offering. 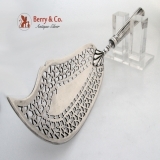 Portuguese 958 standard sterling silver fish slice with Lisbon assay mark, 1816 - 1828. This scarce and desirable slice has a fluted, shaped handle and a heavy, pierced, shaped blade, mounted to the handle on a Palmette form shank. Unusually heavy, large and very usable, this special server weighs 237 grams or 7.6 ozs. Troy and is 12 3/4" long. The soft, warm, original finish is present, with no buffing or machine polishing. The excellent original condition and clear, crisp detail, with no monograms, removals, repairs or alterations, make this an especially attractive offering. We see very little Portuguese silver of the age. 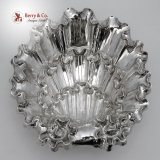 Most of the available Portuguese silver was made in the late 19th or 20th Century. Tardy list this Lisbon mark as being from 1816 - 1828, while Wyler states it to be 18th Century. We tend to lean towards Tardy.